One New Aftermarket Replacement Carburetor that fits Massey Ferguson Tractor models: 135, 150, 202, 204, 2135, 35, 50, F40, MH50, TO35. Mounting Bolts CTC is 2 3/8. Replaces Part Number: 533969M91, 181532M91, 773318M91, TSX605, TSX683, TSX882. Only the 48 contiguous States in the U. 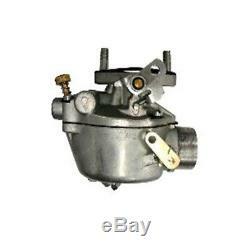 The item "Tractor Carburetor Massey Ferguson 533969M91 135 150 202 204 2135 35 50 +" is in sale since Monday, November 4, 2013. This item is in the category "Business & Industrial\Heavy Equipment Parts & Accs\Tractor Parts". The seller is "stevenslake" and is located in Williamston, Michigan. This item can be shipped worldwide.